This instrumental piece was recorded using the keyboard of my computer. I did correct and modify a few notes here and there. But the main parts were recorded late at night in Cambridge, England, after I had experimented with synthesizer sounds and the idea of writing an instrumental with harmonic layers rather than clear melodies. Or something like that. This is my entry for White Elephant Music Club‘s Skultar challenge. It’s about sword and sorcery (which I know nothing about). And role-playing (which I know almost nothing about). This song took a couple of surprising turns. I started out with the last line of the lyrics and worked my way to the beginning. The acoustic guitar plays a reduced version of the original picking pattern, giving the track more space. I had intended to included at least two verses, but given the mood I barely managed to fit one into 52 seconds. I used a lot of reverb, possibly way too much. Experimenting with sound effects I arrived at the weird version of the guitar tracks you can hear in the background by applying a denoiser. This song was inspired by the season finale of Community. I’m sure I don’t have to remind you that Community is totally awesome. If you’ve seen the last episode this song will make perfectly sense to you. If not, well, go watch Community! 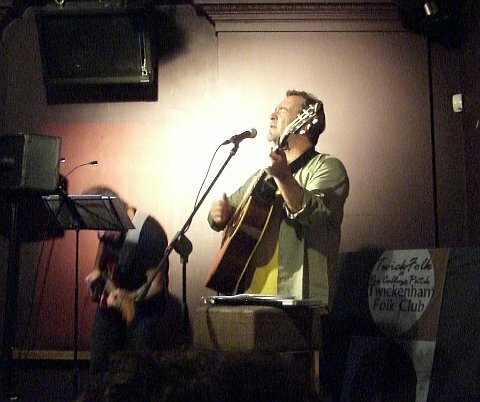 Last Sunday, Richard Shindell played at the Twickenham Folk Club (upstairs in the Cabbage Patch Pub). It was the third time I saw him live. This time around Richard’s music was augmented by the very tasteful electric guitar playing of Marc Shulman. I won’t bother you with boring details (keeping that for the Shindell mailing list). Among my personal highlights were a fantastic version of “Fishing”, the groovy new “Stray Cow Blues”, the 3/4-and-yet-no-waltz taxi drive meets folk song masterpiece “The Last Fare of the Day”, and finally “Wisteria”, the achingly beautiful song about a nostalgic encounter with a place from one’s past. It doesn’t get better than this! The timeless story of “Reunion Hill” and the soothing darkness of “Nora” deserve a mention, as well. Both musicians were in excellent shape. I loved how the whole gig was not a preprogrammed set but a dynamic journey through Richard’s repertoire (along with a couple of cover songs in between). Concert stables like “Transit” were thus played along with requests like “Nora” and “Confession”, the latter featuring very good impromptu arrangements by Marc Shulman. Richard kept telling stories in between songs, which added to the already rewarding concert experience. I really hope he’ll be back in Europe next year or so. This is a remnant from the time when my computer broke down. At first, I imagined the lead melody being played by a violin. But only on the piano did I find a proper way to continue the tune. This little piece of music is possibly a filler. But it’s one you can use to meditate on life and sound quality. My current research requires meta-analytic procedures where variables that contain another variable’s mean come in very handy. Centering Variables is also something very reasonable to do when analysing regressions with an interaction term between a continuous variable and a dummy variable. Centering variables sounds like an easy task. It is if you use Stata but I found it surprisingly difficult in SPSS (unless you enter the means by hand, which is error-prone and impractible for repeated analyses). Here’s how you can calculated a variable which contains the mean of another variable (which can then easily be centered or used in whatever way one wants to). Let dres be the variable of interest. The new variable containing the mean of dres (for all obversations) will be named dresavg. I also show how to create a variable containing the number of observations (ntotal). cdres will be the centered variable.